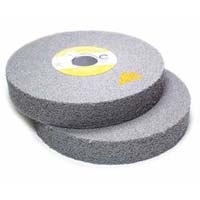 The convolute, or wrapped construction, is widely used for fine deburring and polishing because of conformability. 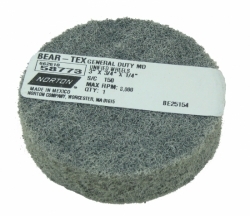 These wheels will maintain critical tolerances and will still provide a highly polished finish. 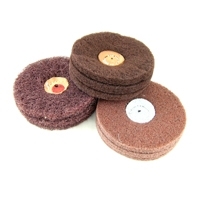 Use to debur fine threads, finish prior to buffing or for conditioning a soft metal surface before welding. Maximum RPM - 6,000. Sold individually. 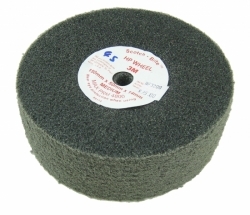 This 6" (150mm) 3M product is ideal for manufacturing use to obtain satin finishes on silver and gold. To produce a satin finish on gold, silver, pewter, and other metals. 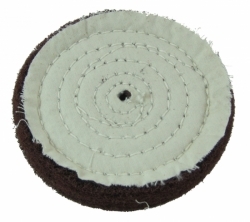 Sewn leather center provides a firm grip. 4" (100mm) diameter, fine, medium and coarse grits with 3 plies. 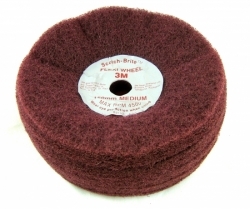 Satin Finish Wheel 3" x 3/4"
Use to obtain matte finishes on metal, wood and plastic. 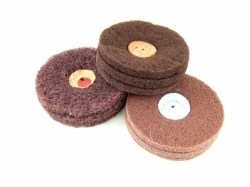 Nylon fibres impregnated with abrasive granules. 3¨ diameter, 3/4¨ thick, 1/4¨ arbour hole.